Gmail is great, but there are several other solid alternatives for consolidating all your email accounts into one app. Inbox vs. Gmail 5.0: Which one is right for you? Gmail is the lifeblood that drives the Android experience. All the data that flows through your inbox powers Google Now recommendations, fills up your calendar, and even tells Google Play what apps you you’re probably into. But there’s nothing to say you’re stuck with the stock Gmail app. There are plenty of other good email apps for Android, many of which will also let you stay connected to your Microsoft Exchange account, Outlook.com, Yahoo Mail, or other providers. Each of these apps offer their own strengths and unique take on how to manage email (although they really like the color blue for their icons). So if you want to play outside of the Gmail sandbox, we’ll help you figure out where to trod towards next. Since you probably have at least one Gmail account (Android is essentially useless without one) it’s worth checking out Google’s smart rethink of how email works with Inbox. We’ve covered a lot of the tricks behind Inbox before, but if you’ve yet to explore it prepare to adjust your workflow from your usual email tendencies, as Inbox is designed to be part of a larger get-things-done system. The app bundles togeether similar emails by category, which is especially helpful for travel, purchases, and updates you’d rather delete all at once. Inbox helps you triage large amounts of email by snoozing messages for later or archiving batches at once. Inbox uses Google’s machine learning capabilities in several ways. When you want to set a reminder, the app will autosuggest phone numbers and contact information. Inbox also offers three replies for many emails, so you can fire back a quick, “Thanks for the information!” or another canned response in order to save time. I’ve personally found Inbox to be an essential part of my workflow, even though it doesn’t have quite the same number of features. If you value Gmail but want some help in managing the deluge of email, then give it a look. While Outlook may sound like a relic from the days of Windows XP, you’ll find it to be a smart, effective email app. Microsoft got itself into the mobile game almost overnight when it bought the well-regarded app Accompli, did a little under-the-hood work, and relaunched it as Outlook. While it of course handles Microsoft Exchange and Outlook.com, it also tackles Gmail, iCloud, Yahoo, and IMAP. Like Inbox you can swipe messages to archive, schedule them for later, or delete them. Outlook for Android has embraced Material Design and works with a wide variety of accounts. One handy task it performs is keeping track of all your files that appeared in messages or have been used frequently in Dropbox, Box, or OneDrive (no Google Drive yet). Microsoft also embraced Material Design, and is constantly pushing updates and new features. If you have an Exchange account or want to consolidate all your email in one app, Outlook is a great option. If you want something that’s a little outside the box for managing several accounts, then CloudMagic may be an option to explore. It has the usual swipe-to-archive moves, but the signature feature is integration with popular cloud services like Evernote, OneNote, Todoist, Pocket, and others. These integrations are available in the form of cards, which you touch inside of a message to send the content to your preferred service. CloudMagic can save your messages to several third-party cloud accounts, which may help to keep your workflow consistent. Another advantage of CloudMagic is there’s a dedicated Mac app so you can have a consistent experience on the desktop (only if you’re using OS X, of course). It’ll cost you $20 if you want to grab it from the Mac App Store. 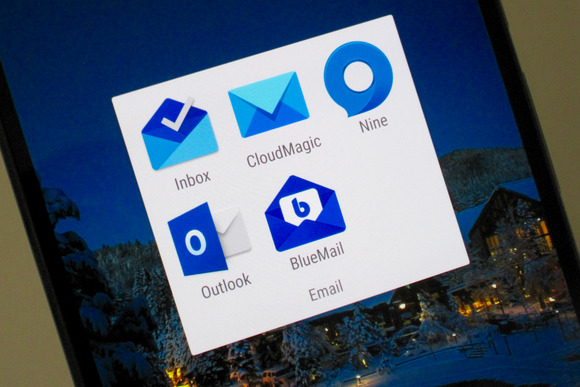 Nine is much like Outlook in look and feel, but it offers a few more customization options. It also smartly integrates with your fingerprint lock, so your email will be doubly secure. Nine is another elegant and customizable alternative if you have an Exchange account to keep up with. Nine is specifically built for Exchange, so unfortunately you can’t use it for Gmail or other accounts. But the app excels at allowing you to tweak how it looks, with a dark theme and different color choices for the background. You’re also able to swipe messages to schedule them for later, archive, or delete. The app also does a good job with calendar and task sync, which meant that calendar invites were always up to date on my phone. One advantage of Blue Mail is that it handles pretty much any service under the sun: Microsoft Exchange, Gmail, Outlook.com, iCloud, AOL, iCloud, IMAP, and even POP3. If you like some of the look and feel of Gmail’s Inbox but want to use it with a non-Google account then this may be the best choice as the general concept is similar with the ability to swipe messages away. BlueMail brings a lot of customization to make your inbox perform just how you want. BlueMail also offers very detailed mail management in that you can set how often certain folders sync, configure quick replies, and take full control over what appears in each swipe menu. If you really want to bend your email app to your will, BlueMail has a lot that you’ll probably like. These options make it clear that Android isn’t just Gmail Central: Microsoft and other developers have taken advantage of Android’s feature set to create some great productivity aides. Email isn’t going away anytime soon, so pick the app you like the best so you can tame this most necessary of evils.